The Corroseum	Forum The Metal Metal Conquest Welcome to the new METAL CONQUEST section and its subforums! PLEASE READ. 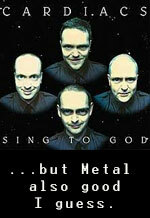 Welcome to the new METAL CONQUEST section and its subforums! PLEASE READ. After eyeing through this part of the forum I've noticed how the vinyl and CD threads are dominated by different people with different tastes and expertise. Furthermore, many thread titles aren't even tagged as specific vinyl- or CD questions, making the browsing experience of this part of the forum a bit precarious. For this reason I've finally decided to split the vinyl- and CD-specific threads into 2 subforums: Vinyl collector hell and CD collector heaven. Maybe I'll add a 3rd subforum in the future for tapes, merch & miscellaneous if the demand arises, but for the moment these kind of issues is still posted in the main Metal Conquest forum. - General discussions/questions about collecting/collectors/collections. - Record store and webstore tips & guides. - Basically anything slightly more record- than music-related but not carrier-specific. - Wanted!-alerts still go in Take It Or Leave It.